1. Download SyncToy and install it. Synchronize: Two Way Synchronization (left to right as well as right to left). Echo: Transfer happens Left to Right. Renames and Deletes are also synced from left to right. Contribute: Left to Right Syncing. Renames are done on right with left as the source. No Deletions occur. 6. In the window that appears, click on Run to start the Syncing Process. In case you want to be able to preview the changes that’ll be done, use the ‘Preview’ option to have a look at the upcoming actions that’ll be taken. So that’s how you sync files between your PC’s hard drive and USB Pen Drive. Should come really handy, I hope. Explore more about: Data Backup, USB, USB Drive. A great post.Was looking for it.I got this page from google.Good for your site.! Same here...I need to find a software that I can install on the flash drive not in the computer. Any suggestions? Please let me know how to install synctoy on my flash drive. I've installed synctoy on my computer and backup to my flash drive, but I can't use it at work (since I can't install a program there). I would like to install it on my flash drive, but haven't been able to. I have been useing AllwaySync'n'Go was looking for somting else to try. I'm not into pying $29 for that program when I can only use it on one drive nd 1 PC at a time. Does anyone know how to sync/backup a single file as opposed to a full folder? I am doing it using FEBE firefox extension but a standalone utility would be appreciated! I solved half of my dilemma: Firefox (Mozilla) has an experimental product, "Weave" that does a wonderful job of syncing nearly all of the Firefox files over the web. 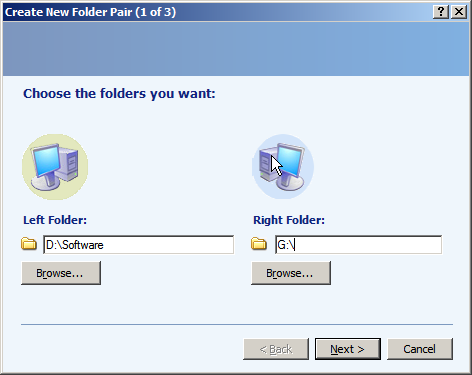 Just load it into two separate computers - the process is very easy and user-friendly. Now I still need help locating the files in Thunderbird so I can sync them. so that I can sync the toolbars. Can anyone help me find these? I use the open source Unison. it's simple but handles synchronizations pretty well. what makes it really nice is that you've a .usbsync file in the top level directory of your thumbdrive which specifies what is to be synchronized on what machine. really nice if your're working on more than one computer and have you're data with you to be easily synchronized at various places. i use it daily. Finally! I love the echo feature! I was using the Microsoft Briefcase, but when I deleted something out of the briefcase (with the intentions of it still being on my PC and ready to be re-copied into the briefcase at next sync-up) it would delete it off my computer when I went to sync my files! I lost some important company files, thank God a co-worker also had these files or it would've cost the company big bucks! Nice post was just what i was looking for. I us it to sync my main copy of firefox (I run the portable version from my computer) with a copy on my flash drive it works great. I use 2brightsparks.com/syncback/sbse.html to synchronize and backup my USB Drive. It has triggers to automatically run when your drive is inserted, which I find to be very useful! "It has triggers to automatically run when your drive is inserted". Hmmm... I don't recall that feature. Do I need to change anything in settings for that? Open Profile, go to "When" tab, then "Insert". It lets you specify by drive letter, label, or serial number. Aibek - did you receive my email? P.S. I have just replied to you email so if you're reading this it's already in your mailbox. I also couldn't figure out how to do the sync automatically. I didn't ever see a "when" tab or anything as described above. Any suggestions? dmailer.com also starts automatically when you connect the thumb drive and i've never had any problems with it. This is good software by i'm not convinced to change. I downloaded TweakUI but unable to add SyncToy to My USB pendrive's autorun property list. Will you show me the method? select all the media radio buttons on the list below. Now plug in your pen drive. in my computer right click the drive and select properties. slect music from the drop down menu. click the radio button "select action to perform"
A 16 year old Techie, High School Student, Blogger and Part Time Freelance Writer from India. He writes about computers and software at Killer Tech Tips.